You’ve probably heard the term “Sweet Spot” used a lot in recent years. Companies that manufacture tennis rackets, golf clubs, softball, and baseball bats have spent millions of dollars trying to convince us that their product has a larger Sweet Spot than their competition. In the world of sports that use striking tools (i.e. tennis rackets, golf clubs, raquetball rackets, etc…) the “sweet spot” represents the area on the face of the racket, club, or bat where the maximum amount of power is concentrated producing the least amount of vibration. The reason a large Sweet Spot is important in these sports is because we don’t all have perfect swings. So the larger the Sweet Spot, the more room there is for error — to compensate for our less than perfect swings. The “Sweet Spot” is where the maximum power is generated with the least vibration when striking another object. 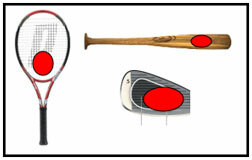 The red areas represent the “Sweet Spot” on each of the objects shown. “Sweet Spot” has also found its way into other industries as well. It is currently being used by a host of companies that make everything from racing engines to high-end audio speakers. In simple terms, I would define a Sweet Spot as being “that point, area, or range within which a particular object functions at its maximum level of efficiency and output — basically, in perfect harmony”. The term “Sweet Spot” means something different to bench rest shooters than it does to BPCR shooters. The rifles that bench rest shooters use typically have free floating barrels and specially shaped and engineered forearms that rest on some type of precision rest when they shoot. When they talk about finding the “Sweet Spot” for their rifle, they are talking about matching a particular load to the barrel of the rifle so that when the bullet exits the end of the barrel, the barrel is as motionless as possible. When this situation occurs, that is when their particular rifle / barrel / load combination will deliver maximum accuracy. If you talk to a BPCR shooter, Silhouette or Long Range, his definition of a “Sweet Spot” will be that point or area along the length of the barrel where he can rest his rifle on a set of cross-sticks without affecting the accuracy of the rifle. The BPCR shooter is basically looking for a “dead spot” — a point at which pressure can be applied to the barrel (from resting on the cross-sticks) but which will not interfere with the natural transmission of harmonic or vibrational waves that travel along and through the barrel each time it is fired. I think that most shooters would agree that the only way to find the Sweet Spot on a barrel is by trial and error testing. This involves resting the barrel of the rifle on a set of cross-sticks or a reasonable facsimile (bench rest cross-sticks), firing successive groups of identically manufactured ammunition, and determining at which point along the length of the barrel the best group was produced. 1) Load approximately 50 rounds of your best ammunition and bullets — the same ammunition that you would load if you were going to be competing in a match. 2) Place your rifle in a gun cradle or stand and place strips of 1” masking tape at 2” intervals the entire length of the barrel, starting just behind the front sight and ending in front of the forearm. Leave a 1” gap between strips. Mark the strip closest to the muzzle of the barrel with a “1” and then number each strip accordingly (2, 3, 4, 5, 6, etc…). 3) Set-up your cross-sticks or a set of bench rest cross-sticks at your local gun club or shooting range. Post targets at the other end of the range and number them “1” through however many strips you have on your barrel. 4) Now, proceed to fire 5 round groups at each target in a methodical and carefully documented manner, resting the rifle barrel on the piece of masking tape marked with the number of the target at which you are shooting. Since my rifle generally throws the first round from a clean barrel outside of the normal group that I shoot, I would fire the first shot into the berm or make a careful note of which shot out of the 5 on the target was my first shot. 5) After you have fired the 5 rounds from Group #1, clean your rifle exactly as you would at a match. Pick an interval of time for the barrel to cool down to an acceptable level, and then repeat the process, this time resting the barrel of the rifle on the strip of masking tape labeled “2”, and shooting at target #2. 6) Continue this process until all masking strip points on the barrel have been tested. Now examine the results and choose the one or two targets that produced the tightest groups. 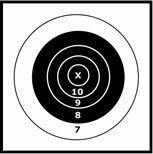 8) Once again, choose the one or two targets that show the best groups, and compare them to the ones you shot earlier. The results should speak for themselves. At this point, let’s say that you have two spots that seem to produce identically good results. Now personal preference comes into play. If one spot is 6” from the muzzle and the second spot is next to the forearm, you need to decide where you feel more comfortable resting the barrel. Perhaps you feel that you have better control over the rifle when it is resting on one spot versus the other, or you feel that it would just be easier to reposition the rifle each time you shot if the forearm of the rifle was placed next to the cross-sticks. Personally I prefer to have the barrel resting as close to the muzzle as possible — about 6” from the muzzle on my Browning Creedmoor. I feel that there is less room for error on my part if the resting point is as far away from me as possible. Remember, you must do your best to make sure that each group you fire is done so in exactly the same way, under the same conditions. If you decide to test the entire length of the barrel and have to break your testing session into two separate days, simply try to make sure that the weather is as close to the same as possible on each day. It’s also advisable to take a close look at the fit between the rear of the forearm on your stock and the front face of the receiver. It is not uncommon to find the forearm either pressing or rubbing against the face of the receiver. If this is the case, it can interfere with the normal barrel vibrational waves and affect the accuracy of your rifle. A very thin gap (i.e. the thickness of a 3” x 5” card) between the two can help to eliminate this problem.